There are certain times in life when you need something to help you get through the day. Something that will help you complete a task, even when you are tapped out. One such product is Awake Chocolate. They have taken two of the most notable and addictive substances on earth and combined them. That is great if you are both a chocolate and caffeine lover. Constant drinking of coffee can become addictive and costly. So why not consider another alternative? This product is no joke. 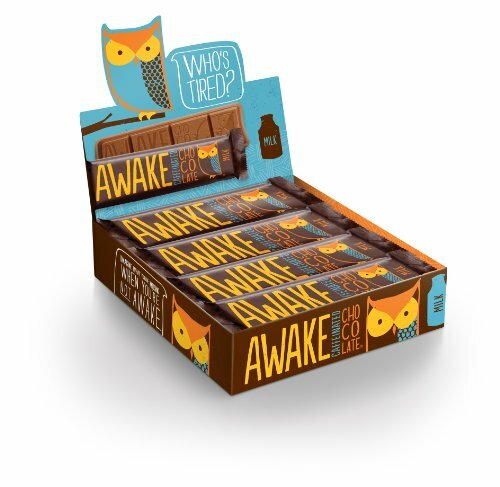 With an owl for its spokesperson and mascot, Awake Chocolate aims to keep you awake, no matter what. But, it is a pity that there is not as much care in terms of the online website and disclosing clear information about their brand. What is posted is simply to maintain the hype of the product. Awake should know that its consumers are interested in learning about the people behind the scenes, creating what they eat. No product secrets are spilt either, just vague meandering language about how the product is a better alternative to your hot brewing cup of coffee. But what are the facts about Awake Chocolate? Well, we would certainly like to know. That is why we decided to dig a little further. Well, they say do not toot your own horn, let someone else do it for you. Awake does not agree. They proudly declare that their products will have you moving faster than Superman himself. Maybe you will break the sound barrier after taking a bite of Awake chocolate. Then you probably should get a batch right away. Again, their diligent employees are touted as being some of the most hardworking in the industry. They should be if they are being gouged with Awake bars day and night. It makes you wonder, if they are not being overworked and how much product would be left for you and me. Hopefully, they can stick to their commitment to shipping out orders within one business day. But, like any product you order online, the delivery time will vary depending on your location. But they say to give USPS one week or less for the nifty product to get to your door. If you are worried about someone getting to your tasty investment, do not worry. A tracking number will be promptly sent so that you can follow your goods as it tracks through any territory. Even if it takes a ship, plane, van or truck – you will know exactly where it is sent and when. Thankfully, technology has made this process so easy. If you are across the pond or somewhere else outside of North America, bummer for you! You will probably have to buy a plane ticket to get to this owl prize. Awake Chocolate vows to make up for this though. Just in case Awake Chocolate was not what you expected and your taste buds were repulsed, rather than captivated by its delicious goodness, you can return it. Or within 30 days of purchase, just email them at info@awakechocolate.com. They are happy to send the owl with a few bucks in refund cash. Now that we have waded through the hype, let us assess for ourselves whether this product truly delivers on its promise. Disappointment can taste bitter and putrid when you are looking for a miracle in a cup and find a scam instead. We do know that the product contains caffeine. This is the key ingredient, which will get you amped up when you are running low on fuel. So, this tasty little chocolate bar is already off to a good start. These guilty little pleasures are rather potent too. Instead of sipping on a full cup of Joe, you can munch on one small bar of Awake chocolate. So, good things do come in small packages. Awake chocolate came to public prominence when many people saw it being sampled on the Dragons Den show. Since then, it has hit stratospheric popularity. Everyone seems to be clamoring for a bite. This has forced the company to catapult the product into many of the large-scale retailers in the country. So, you will not have a problem getting a quick fix if you run out. Wal-Mart, Walgreens and Shoppers Food Warehouse are just a few places that stock them. That depends on where you buy it. People have been stocking these chocolate bars and reselling them online. So, if you venture on Amazon, they are there for as high as $8.00 or more. We would skip that option. These small bars ought to be sold for so much. They are packaged in bite sizes and bar sizes. So, you can get them for a lot less than that. We recommend checking with your local grocer or retail store to see if they have them in stock. If it is $2.99, then that sounds like a better deal. What Chocolate Bars Are Available? However, the Awake website is your best bet. Nobody can go lower than the manufacturer anyway. Billions of people rely on coffee to give them a well-needed jolt to their weary system. Some cannot start their day without it. Consequently, they would be an unpleasant Grinch if they did not drink a cup of coffee. But this is not always possible or convenient to do. Therefore, why not try a candy bar that packs an equal amount of caffeine punch. But, the major advantage that Awake has over its competition is the taste. Usually, when manufacturers try to make caffeinated products, it can have an off-putting taste, to say the least. However, this is not so with Awake Chocolate. It is truly edible. This is why it is distributed so widely. A product that is horrible tasting would not have secured distribution privileges in stores like Wal-Mart and Walgreens. These are national brands with hundreds of stores across America. One great advantage is that you can get the right dosage. They have bite sizes and those packaged in bar sizes. So, if you just need a slight pick me up, or you have an intolerance for too much caffeine or chocolate, the smaller option is your best bet. You can even have a bar in the morning and a few bites throughout the day as needed. In addition, you can stock them up. The more you buy, the more you save. And the cheapest you will get them is on the company site. So, if you want to just have them shipped once in a while, you can opt for the 16 or 50 packs. As you can see, you have options. If dark chocolate is not your favorite, try the milk chocolate and even the caramel chocolate bites. When it comes to Awake chocolates, the choice is yours. Do You Have Chocolate Or Caffeine Allergies? So keep in mind, if you have never tried this product before, start off with a small bite. Everyone has a different preference. Some might not like to mix so much caffeine with chocolate. And be mindful of allergic reactions or any other sensitivity. There is a lot of caffeine in these tiny morsels. If you are prone to migraines, exercise caution even more. If none of this is of concern to you, then jump right on into an Awake chocolate bar. We all need some extra battery life wherever possible.